I’ve been thrashing about trying to learn this program. At WIA I won this sketch up pack and I discovered over the weekend that I like it … a lot. So I still consider myself a beginning intermediate level woodworker. I didn’t grow up wood working, wasn’t exposed plans and the like or other things that would have help my woodworking foundation. I am a geologist by training so at least I have some natural inclination and some training visualizing what I can’t see. And I took a lot of art in high school, so I can draw a little bit. So I’m determined on my current project (the desk) to visualize where I’m going before I start making it. And I really want to learn sketch up. Here’s my practice along with Robert sketch. I’m bettin’ by the time I get through disc 2 I’m going to know most of what I need to know. This entry was posted in sketch up and tagged sketch up. Bookmark the permalink. 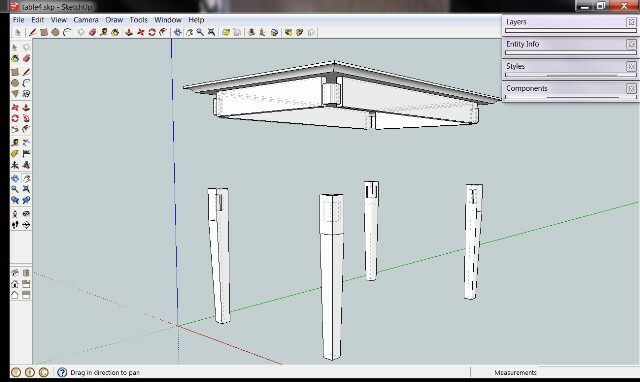 I do not do any project without using SketchUp. I love that program and have been using/learning it for the past couple of years. I took the more trial and error method for learning how to use it and it worked out pretty well for me. I’ve thought about getting some software to better learn but I feel I know enough to build a model for most projects I want. I think software would make me way more efficient though. Good luck and have fun learning such a great program! Yes, I went the booth early and must have missed you. Before I go to my next gathering, I’m going to try and look up pictures of people. I think I miss a lot of folks, including you, because I didn’t know what folks look like. I don’t use sketch up. I have nothing against it, it’s just not my thing. I usually start the planning in my head (where there’s a lot of room ) and then take measurements on where I want my project to go. After that I will usually draw about 3 or 4 rough sketches and hopefully come up with a final drawing. I will admit that one thing nice about sketch up is that it takes care of the art work for you. I’m a rudimentary artist. I know that there are a lot of differing opinions about sketch up, plans, cut lists,etc. People learn, design and build in a lot of different ways and that’s always been fascinating to me. I once saw a guy play music on his violin simply by playing the music with another guitarist. He’d been playing the violin since he was seven. And with no sheet music and not even a preview of what was about to be played… and he could play the music by watching and predicting where the music was going to go. I wish I was that talented. Sigh .. If it helps me learn how to do things correctly, I’m generally a fan. I’ve been using CAD software for a few years to design parts, I find it indispensable for a lot of projects. Certainly not every projects demands it, and fewer wood projects end up in CAD than metalworking projects. I picked up a small stick of Mahogany to make a pair of fancy winding sticks tonight (I’m upgrading from the two scraps of aluminum bar stock I’ve been using). I won’t be modeling those in CAD. But I have an idea for a pair of lamp shades with a Cherry framework and antique mica shades. Modeling those in CAD will really help me figure out the joinery involved. Lamp shades! Very cool. And yes, that seems like an excellent way to use a drawing/design program. I should ask. How is it coming along? I’m still workin’ my way though the CDs and today, I’ll be sketchin’ out my desk. Fingers crossed.